Water . 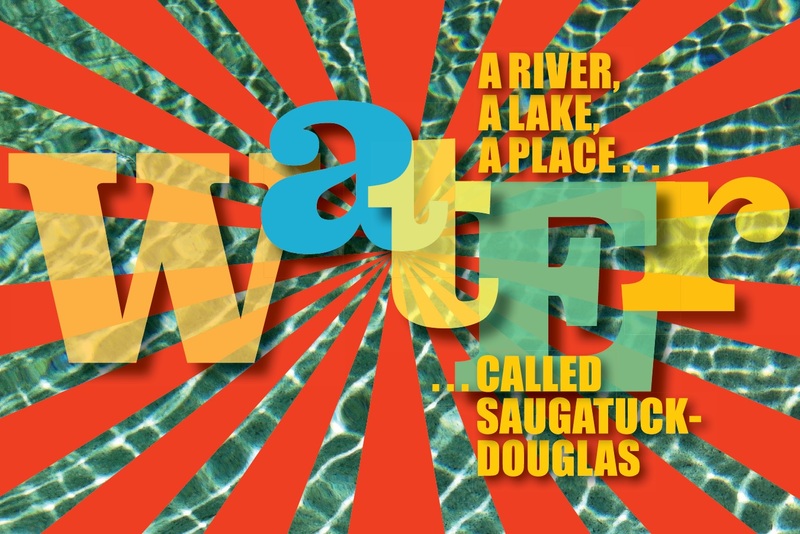 . . A River, A Lake, A Place Called Saugatuck-Douglas engages visitors' imaginations to accompany five travelers, each at different points in time, sharing the experience, discovery and sometimes danger of their adventures along our waterways. Their trips unfold in maps, pictures, narratives and artifacts, plus "side stories" that add interesting cultural perspectives, all set before a vast composite mural of more than 200 historical archive photos that help visualize those earlier times. In Trip #1, the viewer assumes the role of reporter for an eastern newspaper traveling downriver by dugout canoe in the mid-1800s with Ottawa trader "Flying Cloud Woman", seeking the village of Singapore and its fabled "Astor Hotel". The "Astor" turns out to be a humorously named simple boarding house for arriving settlers instead of the imagined grandeur conjured up by naming it after wealthy fur-trading magnate John Jacob Astor. Trip #2 casts the viewer as a mid-1800s logger hired by Saugatuck timber entrepreneur Frank Geer in winter to cut and haul logs over the frozen river to a riverbank "rollway". With the spring thaw comes the dangerous job of rafting a log flotilla downriver, thwarting log "rustlers", and distributing the timber among five lumber mills in Douglas, Saugatuck and Singapore . . .a process that cost the life of one of Saugatuck's prominent early citizens. With Trip #3, the viewer becomes a crew member on the steamer McVea, one of more than 200 ships built in Saugatuck, making an overnight "fruit run" taking peaches and passengers to Chicago in 1893. The McVea stops at Pier Cove and picks up a musician and a famous architect who become interesting travel companions. Trip #4 brings the viewer to Saugatuck from Chicago by tourist excursion ship in 1919 as a teenage girl accompanying school children to summer camp as one of their camp counselors. Among the campers she encounters a youngster destined to become one of America's most famous aviators. On Trip #5, the viewer is a photographer riding along on a local commercial fishing run pursuing sturgeon and whitefish, reflecting on that industry's1890-1950 boom and bust. The trip highlights a key Great Lakes innovation of that era, the enclosed "fishing tug" designed to handle rough weather and allow pre-processing the catch for faster, fresher delivery upon returning to port. After the final trip station, visitors will find a "sticky-note feedback wall" presenting a series of questions related to contemporary concerns about water, and inviting expression of personal viewpoints or suggestions by posting sticky-note responses. Nearby, three display stations feature a review of water quality comparing lake, river, rain and tap water; a collection of rare antique fishing lures; and for visitors of all ages, a fish-identification game. Floating above it all is a fanciful "school" of fish, created by local artists Ted Reyda and Sally Winthers, representing the species currently inhabiting our area’s lakes and rivers. This year's exhibition also introduces a new digital sign-in station for visitors, to better reflect the geographical range of distant visitors and enable them to request e-mail updates on Museum and other Historical Society activities. Design team credits for the new exhibition include: James Schmiechen, curator-writer; Judy Hillman, designer; Ken Carls, Kay Reckley and Sally Winthers, graphic designers; Vic Bella and Ted Reyda, displays; Steve Teich, layout; Jarrett Zeman, consultant; Jack Sheridan and Kit Lane, story consultants; and Sam Fitzpatrick, intern. Continuing the Society's tradition of offering books created to accompany exhibits past and present, the Museum's south gallery gift shop again highlights Storm, Fire, and Ice. Shipwrecks of the Saugatuck Area. Written by Historical Society members Jack Sheridan and Kit Lane, this popular book tells the tales of local ship disasters from the 19th century to the present, including the mysterious wreck of the "Chicora." Designed by Society member Ken Carls, with 68 illustrations, this 72-page soft-cover book won a Michigan Museums Association Design Excellence Award. The south gallery also features the Society's popular "SuperMap" -- a 6-foot high, 12-foot wide illustrated color wall map of the Saugatuck-Douglas area with an interactive computer display to provide a virtual tour through these historic villages, highlighting significant people, places and events of both past and present. Map artwork, created by Holland artist-cartographer Mark Cook based on Historical Society research, recalls the entertaining illustration/poster maps of the 1940-50 era, combining street layouts with stylized sketches and notes. The map offers Museum visitors an engaging way to soak up the story of the Saugatuck-Douglas area. As many as 70 map-highlighted references are keyed by number to let visitors select and learn about sites of interest by calling up information, narratives and images using several video/interactive touch-screen terminals near the map. The screens also offer topical "interactive programs" such as History of Hotels/Boarding Houses; History of Boatbuilding and Boat Builders; Buildings and Architecture; Artists and Painting; Local Biographies; History of Saugatuck-Douglas Schools; 13 Tales of the Villages and A Video History of Saugatuck and Douglas. In addition, the terminals allow public access to the Historical Society's digitized archives of historical photos, pages of The Commercial Record dating back to 1868, the Saugatuck-Douglas Building Survey and more. Founded in 1992 by the Saugatuck-Douglas Historical Society, the History Museum is open daily Noon to 4pm from Memorial Day weekend through Labor Day, then Saturdays/Sundays through September and October. Admission and parking are free.